In The Netherlands, an extensive design procedure for sheet pile walls has been developed. Besides the partial safety factor concept of the Eurocode 7, the Dutch National Annex offers a clear step-by-step design process, checking against failure, verifying stability and allowing optimization of the design. Since its initial development in the eighties, many improvements have been made to suit the needs of geotechnical designers and consultants. The stability of the majority of all Dutch retaining walls has been checked using methods and tools developed by Deltares, the leading Institute for Delta Technology. Previous releases of D-Sheet Piling were named MSheet. D-Sheet Piling is a tool used to design retaining walls and horizontally loaded piles. 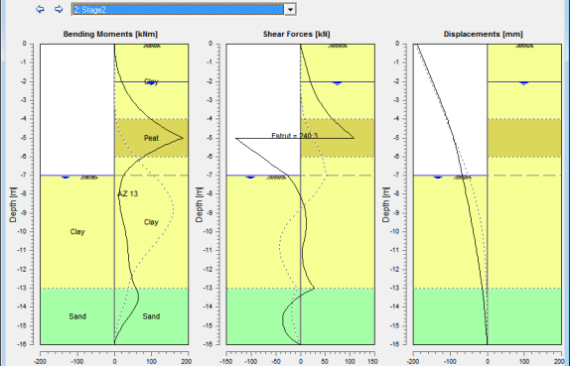 D-Sheet Piling ’s graphical interactive interface requires just a short training period, allowing the user to focus their skills directly on the input of sound geotechnical data and the subsequent design of the wall or single pile. All geotechnical parameters needed for input are interpretated from CPT data. The critical length for the retaining structure is checked automatically by reducing the length of the wall step-by-step, until instability or unacceptable displacement occurs. D-Sheet Piling verifies the safety of the sheet pile wall for selected construction stages by applying partial safety factors defined according to the Eurocode 7, including Eurocode annexes for The Netherlands and Belgium. The user can also define their own partial safety factors. The stability of the anchor wall is checked according to the Kranz theory. A Bishop slip-circle analysis is used to check the overall stability of the wall and soil. Projects can be compared to experiences of real projects and guidelines to help to ascertain if installation/vibration of a sheet pile wall of this type is feasible. D-Sheet Piling comes as a standard module, which can be extended further with other modules to fit more advanced applications: see Modules. 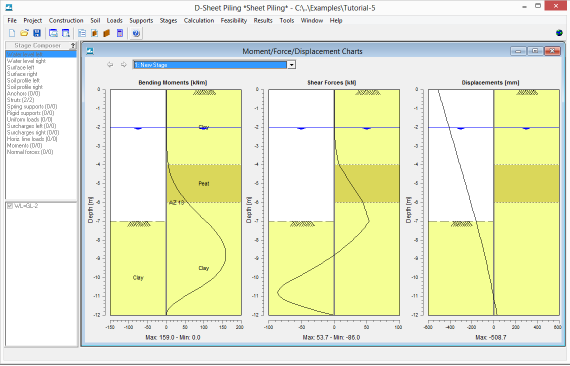 The latest fully validated release is D-Sheet Piling 19.1. This version is available if you have purchased a Service package. You can order a Service package via our Sales Service team (software@deltares.nl). The software can be downloaded via our Download portal. You don’t need a license file to do this. You can use the software in Demo mode without a license file. Our Sales Service team will provide you with instructions on how to get the software working with a license file. Over the last decades, Deltares has been developing and improving D-Sheet Piling, which comes with everything a modelling professional needs in a flexible, stable, robust, easy-to-use modelling suite. Deltares offers high quality software services to consultancy firms, governmental organizations, universities and research institutes worldwide, using these software products. When there are error and/or warning message(s) during a calculation, they are written in the dumpfile (*.shd). Unfortunately, these notifications are not removed before a new calculation. As the generation of the Report is based on the data in the dumpfile, the notifications appear in the Report, while this is not the intention. Workaround: Close D-Sheet Piling, re-start it, reopen the file and run it again. According to the Dutch standard NEN 9997-1+C2:2017 (November 2017), in one of the design steps, a factor must be applied on representative values of the moment, shear force and support force. The default value of this factor is 1.35 for class RC3 and 1.2 for the other classes. However, the program always applies a factor of 1.2 on the support force. Note that the factor applied on the moment and shear force is correct. In some cases, the combination “Charaterisitic Kanz Anchor Strength” with “Vertical Balance” option can lead to an error (only when the vertical balance gives warnings about the resultant friction force that is directed upwards). Workaround: If you unmark the “Vertical Balance” option in the Model window, it will work. When the user changes the unit weight of the water (from 9.81 to 10 kN/m3 for example) in the Water Properties window, then calculates and then open again the Water Properties window, this value is 9,81 kN/m3. This is incorrect, the value should be 10. Nevertheless, the entered value (10) is correctly saved, and properly used during the calculation. The user can check this in the Report, in section 3.1 “General input data”, where the value of the unit weight of water used for the calculation is given. In the Loads menu, the option “Earth Quacke”, where an earthquake force can be entered, is accidently available. This option is still in development and not yet correctly implemented in the program. The user is strongly advise not to use this option because the results are not trustable yet. Warning: no support will be given when using this option. · Case 1: if the “Reduce delta friction angle (s) according to CUR” option is marked and if the delta values in at least one material are reduced during the calculation. · Case 2: if the inputted deltas are high (i.e. more than or equal to 30 degrees). Workaround case 1: The user can change the input values so that the reduction is no longer performed during the calculation. Or he can also unmark the option. Workaround case 2: The user can change the input values so that the deltas ar less than 30 degrees. The vertical balance is not suitable for combined walls. It can not be separated out what is the point of resistance for the upper part. Calculations are based on the point resistance of the bottom part; point the resistance of the upper portion is not taken into consideration. To what extent is D-Sheet Piling suitable to perform an undrained calculation for a layered soil with cohesive properties? 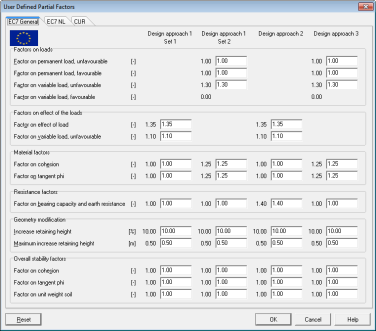 Undrained calculation is not directly available as a special option in D-Sheet Piling; but it can be simulated using phi = 0 and c = cu and moreover by adjusting the water pressures. The user has to calculate or estimate himself the under/over stresses and enter them in the program. Is it possible to model a pile with the Sheet Piling module? entering a pile force in kN divided by the pile diameter (because with the Sheet Piling module, the horizontal force must be entered in kN/m’). Why do the moments in the output window "Moment/Force/Displacement Charts" not always correspond to the moments in the summary table of the report? In a verification calculation with EC7-General of EC7-B, in design approaches DA 1 set 1 and DA 2, the partial factors on the loads are applied on the effect. These factors are not included in the main graph of “Moment/Force/Displacement Charts” and in the figures below (black continuous line) because the factors are included after the calculation. But there are included in the red dotted line. The pictures are not wrong, but the factors are not applied here. The factors are apllied in the summary table of the report. In DA 1 set 2 and DA 3, the factors are applied on the parameters. In both case, it is therefore calculated using updated values, and this is visible in the graphs. CUR verification: Why does Step 9.1 does not appear as a separate paragraph in the report? If an anchor stiffness multiplication factor unequal to1 is used, step 9.1 of the CUR applies. Step 9.1 (Anchor verification) has no separate paragraph anymore. This step is reflected in the summary and the pictures in the beginning of the report. In the separate paragraph only the different anchor load was of interest, but this is already covered by the summary. The moments and forces as displayed in the paragraph step 9.1 are not relevant for the CUR check. For these reasons it was decided to remove the paragraph for version 7.9.1.5 onward. Why do resulting moments divert from calculations made with older software versions? Calculations made using version 7.9.1.5, and above, divert from older versions. The reduction of friction angle(s) delta according to CUR 166, introduced in version 7.7 was not correct. This reduction concerns values of phi over 30 degrees. Refer to the ‘known bugs’ for a work around if one cannot make use of the updated version. Why has my anchor only a plate below the anchor rod? In the MSheet user interface only the anchor plate is drawn below the anchor rod. Only the distance rod-bottom anchor plate is entered in the user interface. For the Kranz stability this distance is required; in the calculations it is assumed that the plate runs up to the surface. For the reasons above it was decided to only draw the lower halve of the anchor plate. Why do results for modelling for under water concrete provides unusual results? Calculating the vertical force balance (also under the CUR design code), it is of importance which side is passive, as the direction of the vertical force is upward on the passive side. 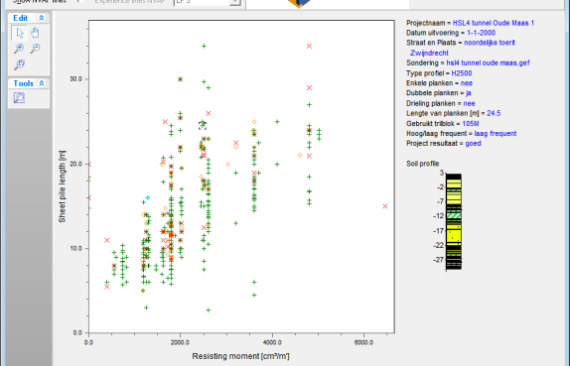 Whether or not the side is passive is determined based on the which side has the largest percentage of soil mobilized. If one is modeling for under water concrete, the high strength of the material may incorrectly results in the assumption of a passive opposite side. If one is modeling using CUR design code, the lowering of the active side may have a likewise effect. This should be overruled within the stage overview by indicating which side is passive. CUR verification: Why are steps 6.1 and 6.2 are not always calculated? In step 6.1 and 6.2 the phreatic level on the passive side is increased. This can be unfavourable when the phreatic level is below surface. When the phreatic level is upon or above the surface an increase is always favourable. Therefor steps 6.1 and 6.2 are not calculated. CUR verification: Why is the maximum value for an anchor/strut not always displayed in the report summary "Anchors and Struts"? When method I is used, MSheet determines the highest anchor force over all stages and verification steps (6.1-6.5). The verification of the anchor force is made with the verification step with the highest anchor force. A verification with method II shows a slightly different result, because for each stage the verification step with the highest anchor force is selected. If multiple anchors are present, both methods do the verification using the same step. Why do I receive a warning when I try to export my report to pdf? The most likely cause is a memory problem. If you select the Export Report option in the File menu it is possible to choose a lower resolution for the images: Choose Options and select a smaller Picture quality. Another option is to increase your available memory either by shutting down other applications or increasing the RAM size. Why can't I open the Help from within D-Sheet Piling? What is the difference between 'fine' and 'coarse' in the calculation options? In MSheet the earth pressure coefficients are calculated for each element. On the elements intermediate nodes are placed. These nodes use the earth pressure coefficients of the element, this is the ‘coarse’ option. 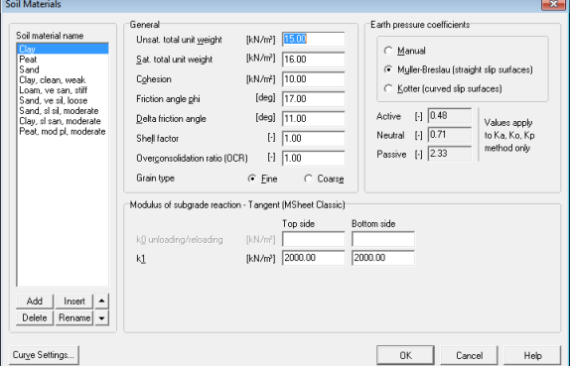 For the option ‘first stage represents initial situation’ it was found that the earth pressure coefficients had to be determined at the intermediate nodes otherwise installation with neutral stresses at both sides was not correctly modleled, this is the ‘fine’ option. However this means that five times more earth pressure coefficients are calculated compared to when using the ‘coarse’ option, so the calculation time is significantly longer. The results of both methods may differ. These differences occur mostly at slopes or loads close to the sheet piling. In these cases the ‘fine’ option is recommended, in other cases faster calculations can be made using the ‘coarse’ option. What are the differences and similarities between the old DOS program MHORPILE and the new Single Pile module in MSheet? In principle they are the same, but the Single Pile module is somewhat more limited than the old MHORPILE program. In the Single Pile module no raking piles can be calculated and the ‘de Leeuw’ tables are not incorporated for the soil displacements. Why do I see support forces that were not introduced in the project? MSheet calculates support reactions for each node based on equilibrium considerations for every phase. Support reactions larger than a certain value are reported. However, in some cases there are support reactions in nodes where the user did not introduce a support. In these cases, the magnitude of the support reaction is a measure of a certain error made in the calculation as the basic equation for the sheet pile wall assumed relatively small deformations and bending. When the deformations and bending become larger, extra forces and moments are introduced in the calculation to try to satisfy the basic equation. You can consider the calculation to be accurate enough when these values are small compared to the actual forces and moments. However, when these values are relatively large the sheet pile wall will not react according to the assumption of the basic equation anymore. In that case the deformations will often be unacceptable in practice. Unintentional support reactions can also occur when there is a large difference in stiffness between neighbouring elements. What is meant by “acting width”? Where b is the acting width. This is the width of the soil that is pressing against the pile or wall. The EI must be specified for each acting width. For a sheet-pile wall, the calculation is actually performed using a standard acting width of 1m. The EI that is specified is therefore the EI of 1m of wall. The results are also per acting width – that is, per 1m. For piles, calculations are often made with an acting width other than 1m. For example if the pile is 0.5m wide, and the width of the soil pressing against it is 1.5m, the acting width is 1.5m. The EI of the pile must then be divided by 1.5m. This models a situation in which 1.5m of soil is pressing against a pile of 0.5m. Another use is for constructions such as combi-walls and Berliner walls, where the acting width changes over the depth. See for example manual, tutorial “Modelling of combi-walls”. What does the option "Reduce delta friction angles according to CUR" do? CUR 166 states that for rough steel walls or comparable walls, the calculation of the passive earth pressure coefficient may be based on straight slip planes, provided that delta is a maximum of 30 degrees. For a rough concrete surface, a maximum delta of 35 degrees applies. For higher values, curved or angled slip planes must be used for the calculation. 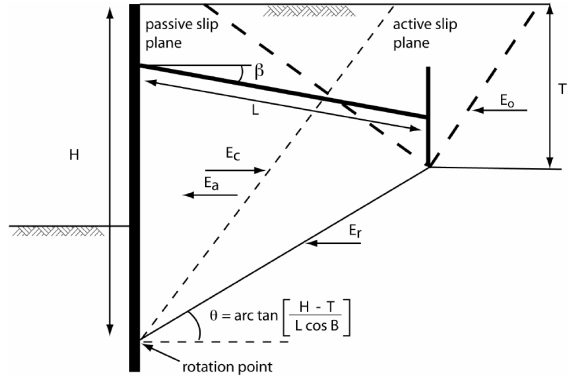 The reason for this is that straight slip planes give values that are too optimistic for the passive earth pressure coefficient and that the value in the case of an increasing resistant strength will start deviating from the value determined with curved slip planes. This occurs even if, as is usual, calculations are made with a lower wall friction angle for straight slip planes. In Table 1, Columns 2 and 3, a comparison is made between curved and straight slip planes, based on a rough wall surface. In the fourth column, the passive earth pressure coefficient is calculated for a straight slip plane with reduced wall friction angle. It has been reduced in such a way that the passive earth pressure coefficient matches that of a straight slip plane. The angle used is displayed in Column 5. Straight slip plane *: Calculated with the (reduced angle) from Column 5. When calculating using the (c,phi,delta) method (straight slip planes), the value should be reduced to the value in Column 5. The reduction applies to steel walls with a delta larger then 30 degrees and rough concrete walls with a delta larger then 35 degrees. Why does the results of a ‘Design Sheet-piling’ calculation differ from a usual calculation? Assuming that the ‘Representative’ class has been used with ‘Design Sheet-piling’, it may be that the ‘Manual’ option is active. In that case the earth pressure coefficients are not recalculated but are extracted from a file. Notice that when a safety class is chosen, under the Design option not a complete verification will be made. This requires the Verification option. Why is the horizontal button bar not displayed In the ‘Design Sheet-pile Length’, ‘Verify Sheet-pile’ and ‘Allowable Anchor Force’ windows? This is an error in MSheet that occurs only with the Windows setting ‘Large Fonts’. The easiest way to solve this is to choose to use ‘Small Fonts’. However, if you want to continue working with ‘Large Fonts’, you can operate the buttons using the keyboard by pressing the key combinations: Alt+S for Start, Alt+C for Close and Alt+P for Print. You can also use the arrow keys (up and down) to select another construction phase. Why is it that after adding construction phases or anchors, the answers for the unchanged construction phases also change (somewhat)? MSheet creates nodes on all supports and layer boundaries. If an anchor is added, for example, the total node layout (even in the phases where nothing changes) may be adjusted. This can result in small differences in the outcomes. Minor alterations in the input give rise to major differences in the outcome. Why is this? This can occur if the calculation process does not converge properly. In the report of the calculation, this is reflected in the number of iterations required for the calculation. Approximately six iterations are quite normal, but if the number exceeds ten, this indicates an improper calculation result. One of the causes can be a small ratio between the rigidity of the sheet-pile wall and the modulus of subgrade reaction. This problem can be solved by using a more rigid sheet-pile wall. How are (prestressed) anchors implemented? The wall can be supported by one or more anchors, either prestressed or not. In successive phases, it is possible to remove or introduce anchors, or to modify the prestressing force. The size of the anchor force is executed at the end of every phase. The non-prestressed anchor is considered to be a spring support. The flow force that is specified applies as the upper limit of the anchor force. The lower limit has the value 0, so that no compression can occur in the anchor. After flow, hysteresis is taken into account. The load from the wall as a consequence of a prestressed anchor is considered to be a point load the size of the specified prestressing force. When the prestressing force is specified for an anchor, the resulting anchor force is equal to the specified prestressing force. This can be modified for each phase. When a prestressing force specified earlier is omitted in a subsequent phase, the anchor is considered to be just a spring support (see ‘Non-prestressed anchors’ above). The program does assume, however, that the prestressing force will be maintained. The total anchor force is then equal to the prestressing force, increased or reduced by the force caused in the anchor by the extra displacement in the relevant phase. Why is the passive resistance calculated with delta=2/3 * phi, where according to the Spundwand Handbuch delta=0 should be applied at the location of horizontal anchorage by an anchor plate? The deltas specified together with the soil characteristics are applied. For an anchor plate, a delta greater than 0 may in principle be used if that delta satisfies the vertical equilibrium. If not, the delta with the soil characteristics must be adapted. They are also part of the zip-file that contains the software and manual. This file can be downloaded via the Download portal. For use of the Feasibility module an Internet connection is needed.